Much has been written and said about the origin of the dog, but more ideas have probably been advanced, discussed, developed and rejected over the past 10 years than in the entire 20th century before. Some maintain that the first wolf domestication events may or must have taken place well before the start of the dog's fossil record, others that the latter is the only valid starting point for the dog. To wonder if we need to look far beyond the start of the dog's fossil record for it's domestication to have started in the first place. To evoke a few basic mechanisms known from domestication processes which would most likely have played a role in these events and give two basic scenarii. Both skip practical problems which would most likely have arisen, in order to keep these stories short. The aim here is merely to develop a few lines of reasoning, which additions and objections may develop, modify or invalidate later on. Neither of the two scenarii goes any further than the first step of "adoption" of (a) wolf cub(s) into a human band. How many events of this sort have failed, how they failed before one has succeeded and what ensued when this happened is another story. All this has started as part of a manuscript on the way to live and work with dogs I have developed over the past few decades and as a communication paper to exchange viewpoints with colleagues. Vilá et al. 's (1997) paper suggested that genetic separation between the wolf and the dog might go as far back as 135 000 years BP. It fuelled many more or less new trains of thought, mine among them. The fossil record for domestic dogs doesn't go any farther back than some 14 000 years. Leonard et al. 's (2002) paper narrows down the dog's origin spatially to East Asia and temporally to between 15 000 and 40 000 years ago. Their genetic evidence for this geographic origin is " supported by a morphological feature diagnostic of domestic dogs and also found in some Chinese wolves but generally not in other wolves." New papers with more precise mtDNA dating of the dog's origin are forthcoming (Savolainen, pers. com.). Molecular palaeontology is all about extrapolating from mutation rates and gives a "window" of possible times, whose "lower sill" often gives older "dates" than the fossil record. As long as the latter do not confirm the former, these extrapolations remain indeed what they are : hypotheses waiting to be confirmed or rejected. From various sources I drew up a comparative timetable of events in human and canine evolution, which I'll include in this paper as an appendix. Some temporal coincidences appear striking, but they, too, are just that : parallels which may be hypothesised about. Whatever anyone may think, there's no harm in hypothesising as long as one accepts the fact that a hypothesis is and remains a train of thought which one must always be ready to discard if and when it is shown to be invalid. Based on molecular palaeontology data, Gribbin and Cherfas (2001) suggested that the separation in the anthropoid line between man on one side and the chimpanzee and gorilla on the other might have taken place around 4 million years ago. And there comes the Koumaï (Sahelanthropus tchadensis) find (Brunet et al., 2002)!!! Where Vilá et al. 's (1997) and Leonard et al. 's papers suggested that dogs might have separated genetically from wolves much earlier than the fossil record suggested, which was and still is much doubted, here the new fossil record suddenly set the "proto-human" clock back to 7 million years before present, 3 million years earlier than Gribbin and Cherfas' suggestion from molecular palaeontology, which many will have considered bold already. This goes to show that whereas in most cases molecular palaeontology data enlarge the temporal window as compared to the fossil record, the latter is still every bit as surprise-prone as my palaeontology professors cautioned me to consider it. How reliable is the fossil record in the first place? In palaeontology, fossils of species which had a wide geographical span, little geographical variation and a short lifespan are termed tracer fossils, which allow us to date strata according to their presence or absence. Such marine species as Nummulites sp. and foraminifers spring to mind. On land, rodent teeth have been used for the Holocene. Rodents evolve relatively fast, their way of life enhances their chance of being fossilised in numbers (e.g. mass drowning inside their burrows by floods) and their teeth, which are more resistant to erosion than bones, are easily transported with and buried in the finer sediments allowing species identification and stratigraphy. Most terrestrial mammals, however, are restricted in their geographical distribution and mammals' evolution is slow as compared to smaller and/or les complex organisms. Canids have a wide geographical spread, but also a marked geographical variation and their evolution rate is not sufficiently fast, so their fossils are not of great use to date more than some major events and periods in human (pre)history. How great is the chance that a mammal leaves fossils we can identify with certainty in the first place? Ideally, the carcass has to be covered beyond scavengers' reach to avoid its being damaged and scattered. Then this cover needs to be of such a kind as to conserve its bones or imprints of them if nothing else. Tollund man and Ötzi (Wikipedia) and other peat or ice carcasses, the Holocene animal fossils found at Rancho la Brea (Wikipedia) or the mammoths in the Siberian permafrost are very exceptional cases indeed. The fossilised remains need to survive subsequent geological events : tectonics, landslides and erosion which may uncover but also damage them and/or spread the parts over large surfaces, and so on. In more recent times, human activities such as ploughing, burning each other's settlements and/or building new ones over them have further diminished the chances for fossils to remain intact or, if they did, to remain in the stratum they originally belong in. Construction work, quarry exploitation and so on are wiping out geological and archaeological information every day. Though human waste dumps are potentially rich resources of fossils, more or less man-associated scavengers (fox, jackal, wild boar and pigs, and last but not least the wolf, to name just a few) have been "disturbing" (for us at least) factors. Without mentioning man himself, who, for health reasons, has burned carcasses of other species and of his own. If not, the waste dump of the Tour du Valat research station in the Camargue might have become a superb future source of flamingo fossils after 2800 of these birds were examined there in 1985, out of the roughly 4000 killed by severe frost. When thaw set in, the carcasses had to be burned. The same goes, of course, for human and animal carcasses during and after warfare or epidemics. Last but not least : even if a skeleton (for this or its imprint and some teeth are nearly always the only things remaining) has "survived" we still have to find it. All this added up, how much of a chance do we have to acquire a recognisable fossil of a species that lived a long time ago (although our ever-advancing identification and dating techniques are a great help)? And how sure are we about their classification? The dire wolf (Canis dirus), who lived in North America only, died out about 10 000 years ago and is known only through its bones, notably from the Rancho la Brea site. It has been classified as a separate species within the genus Canis. Unless the more recent a- DNA techniques give us some information about it, what do we know about whether it might or not have been able to crossbreed with Canis lupus, Canis latrans or the already existing domestic dog (whose oldest fossils in North America dat back to about 12 000 years ago) and, having done so, whether the offspring were fertile? Such a-DNA work is now being done on Neandertal bones (Hirst, 2006), but the only thing known so far is that their genome was close to ours, as are the chimpanzee's and the gorilla's, with whom we can not interbreed. Leonard et al. (2007) have analysed mtDNA from permafrost-conserved material as well as morphologic and radio-carbon data to study the extinction of what is termed an ecomorph of the current wolf. If we had any DNA of C. dirus, would it have been called an ecomorph as well, rather than a separate species? So how reliable is our fossil record and the ensuing classification in species and subspecies? How often has the geological time table been revised when "new" fossils dating back further than the until-then known origin of their taxonomic group were discovered? "Entre chien et loup" (between dog and wolf) is a French expression for dusk or dawn, the times of day when light conditions are mitigated. When did this dawn for the dog start and when was there enough light for it to appear with certainty? Would an analogy to electric lighting be more appropriate? It took us some time to get from it's invention and use to getting its sources to be as stable an reliable as they are now. As mentioned, Leonard et al. 's (2002) paper has shown the dog to originate from East Asia. This is hardly surprising as East Asia may well be the area where man's progressive change from hunter-gatherer to herder first started, even though the oldest conclusive finds of these new activities have not been made here. There's no doubt that even an only rudimentarily domesticated canid would have been a great help to our far ancestors in their fist steps from hunting to husbandry. Anatomically modern man is supposed to have come out of Africa into Eurasia between 100 000 and 150 000 years ago. Until then he was present only in Africa and wolves only in Eurasia and North America. If the earlier limit holds, the two species would have met 150 000 years ago. For genetic separation between wolf and dog have started as early as 135 000 years ago, modern man should have got to East Asia 15 000 years later and/or have started "socialising" with wolves as soon as he got there. Other Eurasian wolf subspecies are present in the dog's genome, but this can be explained by subsequent crossbreeding. It would seem hazardous indeed to postulate that man would have domesticated some wolves on his way to East Asia, whose genome remained in the dog gene pool after domestication became a lasting affair. Belyaev's work, as described by Trut (1999), Grandin et al. (1998) and other authors has shown that morphologically and behaviourally distinct domestic foxes could be bred from the silver fox (Vulpes vulpes) in only a few decades of selective breeding. The selective criterion at the outset was their lack of fear of man and morphology quickly followed this selective breeding, with remarkable similarities to the differences between wolf and dog (rounder head, floppy ears etc.). As this result was obtained in such a short time and thence such a small number of generations, couldn't we suppose that a few millennia might have sufficed for dogs to differentiate from wolves under selective breeding pressure from prehistoric man even if didn't operate according to such a selective breeding protocol as Belyaev's? Fairbairn (unknown year) compares skulls of wolves born and raised under different circumstances, which indicate that skull morphology may start to diverge even within one generation or lifespan. Morphological divergence between the dog and the wolf might therefore have ensued in a very early stage of domestication. It would probably have been dimmed by interbreeding with wild wolves. We still see this in Papua New Guinea with pigs : most often only female piglets caught wild are kept tame and wild males are used for reproduction. Also, we would still be far from the morphological range of dogs we now have, from big breeds destined to keep wolves away from our livestock to such small ones that even a fox or a buzzard might take them for a tidbit. Yet the fossil record would very quickly have revealed differences between wolf and dog. I am expressly not saying that (much) earlier events of man and wolf sharing more than "parallel lives" can not have taken place. Indeed, such events would appear almost unavoidable between two species living so closely together with such similarities in their ways of life. Yet these events would not seem to have carried on long enough to give rise to a domestication process that we have found any traces of. I am, therefore, not saying either that "the fossil record has been right all along after all". For the moment no hypothesis of any species' origin can be definitely confirmed without a fossil record to show for it. Yet molecular biology data indicating earlier origins should be taken seriously and can be used to fuel working hypotheses to direct quests for fossils. If any dog fossils previous to the current record have existed or still exist, East Asia would be the place to look for them. However, this area has been under intensive agricultural land use for very long and great parts of it have been taken over by urbanism and industry. Therefore, chances that early dog fossils would have been found there are slim. Whether and for how long individual taming events that never resulted in domestication have happened is anybody's guess. However, we may well have a look at some basic mechanisms that may have helped one of these to turn out successful. a process by which a population of animals becomes adapted to man and the captive environment by some combination of genetic changes occurring over generations and environmentally induced developmental events recurring during each generation. Asian elephants are an example in that each individual was caught in the wild and trained to work for man. No breeding in captivity took place, until later on in zoos. The example if pigs in New Guinea is intermediate : females, whether caught in the wild or born in captivity, were and still are made to reproduce with wild males. As for wolves, no other morphological differences could thus be expected than those described by Fairbairn and a lasting trend of genetic change would not be expected under this type of practice. Wolf and man have lived side by side as colleagues and competitors from the moment they were both there and as long as man remained a hunter-gatherer. Both may have scavenged each other's leftovers, probably with a change in balance when man "domesticated" fire. This allowed him to drive big carnivores from their catches and keep them from his, to preserve meat by cooking and smoking and facilitate its drying, thus making it a more lasting resource, to be guarded more preciously against competitors. No need here to go into such considerations that the fact that cooked meat is easier to digest may have played a further role in the evolution of man's brain (Allman, 1999). The use of fire also allowed man to hunt differently. Apart from improving his weapons (hardening the points of wooden lances, working flint differently, and so on), the use of fire made it easier to "overkill" by chasing entire herds of herbivores into swamps or over cliffs. This left considerable quantities of carrion for scavengers. Until recent times, wolves and other scavengers, including the poor among the human population, found food on waste dumps (indeed, these very days many of our fellow-humans are still reduced to such a way of life). Coren (2000) cites studies showing that Polynesian settlements with dogs could stay in the same place for a longer time thanks to the scavenging dogs' cleaning work. In a hunter-gatherer way of life, waste dumps would probably not have amounted to much, as camps moved frequently and little was left over from carcasses. Overkills, however, would have been another matter and might have incited carnivores to pick up the habit of visiting the sites at the right moments, as American bears still do for salmon migration. Belyaev and his colleagues operated a strict selection on foxes that were least afraid of man (Trut, 1999). In prehistoric times, wolves probably didn't have the deep- rooted fear of these bipeds they have developed over subsequent ages of persecution. The least timid ones would have been the ones to profit most from man's overkills and thus have selected themselves for life nearer man than other wolves. Man's overkill sites would have been located along migration routes and more precisely chosen for specific terrain features such as marshes, cliffs or dead ends of canyons into or over which to drive their quarry. They would therefore have been determined in time (migration seasons) and space (geographical opportunity). Wolves with dens near these places could expect a plethora of food at certain moments, especially those of spring and autumn migration. They would have gained a selective advantage because they were (almost) certain to have a rich food supply for themselves and their offspring in spring and / or in autumn to fatten up for winter. This evokes the concept of self-domestication through seasonal commensalism, as these wolves would have chosen chose to live nearer man than others of their species and would thus have made a first step towards a closer association with him. They might also have learned to help themselves by alerting man to the presence of other scavenger species they themselves would be hard put to drive away, but who were no match for man and his fire. Now was the first proto-dog a wolf cub from a litter whose mother was more or less randomly killed in the course of hunting? Or did it come from a wolf pack living near a hunting camp, after its mother and perhaps one or two other members of the pack were killed when trying to break into man's larder? In other words : Did they spring from parents which could have been just any wolf anywhere or from a pack which might well have chosen to "hang around man"? Let us therefore explore two imaginary scenarios, the first of which is close to the one described by Konrad Lorenz and a variation of which has been more recently woven into Jean M. Auel's books. The second takes the self-domestication tack outlined above and comprises some bolder "fictional colouring". A band of our ancestors is out hunting in the prehistoric Eurasian steppes. At a distance, a wolf pack observes them. When the humans have located a herd of antelopes, some of them take up strategic ambush positions whilst others fan out and prepare to drive the herd to them. Just then, the wolf pack turns up and makes the antelopes flee in another direction. Whilst the human hunters are cursing the wolves by the names of all the deities they can think of, three lionesses surge out of hiding and pounce on the antelopes, chasing the wolves away. A close escape from a hassle with these super-predators of whose presence they, contrary to the wolves, had not been aware and from whose anger at this disturbance of their own hunt they'd have been harder put to escape than the fleet-footed canids. Our human ancestors had never heard of John Krebs (1981), but they would have agreed, in their way, with his "life and dinner principle" : better lose a potential prey than one or more of their hunters. Later, after a successful hunt and a good meal, the human tribe is sleeping. Wolves , attracted by the odours, have been seen slinking around the camp, but the fires keep them at a distance. Suddenly all wake up to the wolves' growling and yapping, followed by equally antagonistic vocalisations from a band of hyenas. These bolder would-be thieves would as happily have made away with one or two children if they couldn't get to other meat and our ancestors have a job of it to chase them away with burning torches. Comes the day when the humans kill several wolves near their den, as their fur makes good winter clothing. Among the dead wolves is a female with swollen teats, showing that she had a litter. As the cubs are tasty, the hunters seek out the den and dig them out. One of the children, however, is charmed by these balls of fur, gets hold of one and refuses to let it go. The tribe's leader shrugs his shoulders and lets it go. After all, if the cub survives it will make a more substantial meal and a bigger soft fur later on. The little proto-dog, as I'll call it, is fed leftovers. Perhaps, if it's not yet weaned, one of the women may take it at her breast, as is still done with captured piglets in Papua New Guinea raised for later consumption. It grows up among the humans and sleeps with the children. Growing up, it shows a considerable appetite, but its vigilance repeatedly alerts the humans when predators and scavengers skulk around the camp. After a while, the proto-dog starts following the hunting parties. At first, the hunters try to keep it away, but it's too nimble for their sticks and stones and follows them at a distance. One day they wound an antelope which manages to get away. The proto- dog laps up some drops of blood and starts to follow the trail. One of the hunters decides to follow it and with its help finds and kills the exhausted quarry and brings it back triumphantly. His colleagues and he quickly learn to benefit from the proto-dog's flair. A tribe has settled into its usual spring and summer camp. Scouts have been out for weeks and messengers have kept the main body posted about the bison's migratory movements. Their kill site has shown its worth for many years : only one narrow trail leads down the cliffs to the river's floodplain here, near one of the few places where the melt-water-swollen river is fordable in spring. Of course the brunt of the herd gets away each time, but the number they do catch is more than enough for them and scavengers take care of the rest. The hides along the migration path have been repaired from winter wear and tear and stocked with material to start fires fast. The evening before the herd is expected hunters settle in them with containers that keep their ember contents from spreading the much-feared scent of fire for the bison to smell. More hides have been set up to light fires at the herd's rear and a site on a hilltop is ready for the scouts who follow the herd to give the signal to start a simultaneous blaze at the right moment. Tension rises. Failure is rare, but has been known to occur and much depends on the hunt's success for the months to come. A plume of smoke rises from the hill. Mere minutes later the fires are ablaze, pushing the panicking bison forward and towards the cliff. People run up shouting and waving torches picked up from the fires to add to the animals' fear. In the milling and thronging scores of them are pushed over the edge. Nearby, the wolf pack whose den is in the base of the cliff at the top of a scree slope has been observing the recurring events. Just as swallows announce the coming of spring, humans announce the coming of bison and the two together announce a profusion of easy meat. They're not the only ones aware of the sequence : hyenas, jackals, wolverines, bears and other scavengers have gathered to await the feast. The good thing for the wolves is that humans are more wary of the hyenas, bears and wolverines than of them. No easy opponents for wolves, these, but some yapping and growling at them mostly makes the humans come up to chase them away and the jackals and other small fry are no match for wolves. Experience has thus taught them that it's profitable to remain near the humans and that there's good reason to defend this particular territory against other wolves. On their side, the humans have got used to the wolves' presence and appreciate their help in keeping the hyenas at bay. Of course the wolves get away with a part of the quarry as well, but their help makes it easier to get the valuable hides off the carcasses before the hyenas and wolverines get at them. As for meat and other parts, they need the time to take what they want most and at least wolves don't urinate on the carcasses as wolverines do. The humans carry their booty to their camp on the plateau, in case a flash flood inundates the plains. There they dry and smoke the meat, cure the hides and work the other parts. At the kill site, the horde of scavengers finishes the remainders and most of them move away, but the wolves, who have their den there, don't. Now the greatest rush is over and the humans have both more time and more of a reason to keep scavengers away. The wolves have learned that human fires are not a danger unless wielded purposely against them and can't help trying to steal meat from the drying and smoking racks. Yet they are a help to keep other, more dangerous and harmful scavengers at bay and more meat would be lost without their presence. As spring draws into summer, the tribe lives partly on the conserved meat of the bison, but mostly on their hunting around the camp. The wolves have moved their growing cubs nearer the camp and follow the human hunting bands to scavenge on leftovers. They also save the humans the trouble of taking whatever they discard around the camp far enough away to avoid being bothered by their rotting. The wolves have another resource as well : the rodents and other small mammals attracted by human food stores, which are wolf-proof but not rodent-proof and their predation helps. The children know where the wolf lair is and go there to play with the cubs, knowing they have nothing to fear from the adult wolves (see notes hereafter). Then one night a bear manages to slip close and open a food cache. The wolves are upon it, if only to drive it away from the immediate surroundings of their lair, and the humans follow fast. In the ensuing confusion, not knowing exactly what happens, they kill several wolves. Among them is the alpha-female, the mother of the pack's cubs and several more high-ranked adults. They discover the real culprit too late to avoid their error, but at least the wolves' early arrival has saved them the risk of one or more of them getting maimed by the furious bear. From hunting alongside with wolves for many generations, the humans know the "decapitated" pack will stay in the area but have great trouble raising the cubs successfully. After lengthy talks, they decide to try to adopt them. Having grown up in a pack which had little fear of man and used to being handled by the children, one or two surviving females learn to live in this social structure which resembles theirs. Unprepared for pack life in their own species as for living alone in the wild, they mate with lone wild males, but have little choice but to seek help from the tribe for their pups to survive. Their litters grow up entirely in human company. With them, a lineage is born. Who knows how many events of this kind have had to happen for one of them to become lasting? All we know is that it may have happened this way some day. Why bison? For no special reason, but it was one of the migratory species humans hunted in periglacial Eurasia. Mammoths or caribou (I go along with Bjørn Kurtén (1995) in preferring this name to that of reindeer for the latter's Pleistocene ancestors). At any rate, it needed to be a species with seasonal mass migration. There's no reason why hyenas and other scavengers would not have established their headquarters near human kill sites as I've depicted the wolves to do. However, what interests us is the proximity of wolves and humans. We don't have wolves and hyenas living in the same areas anymore, but one may doubt whether the two species would den near each other and as it's the wolf that has been domesticated, not the hyena, kill sites with hyena dens near them wouldn't help us along. Barry Holstun Lopez (1978) mentioned that North American Indian children played with wolf cubs, but that bringing them back to camp was considered useless as they would adapt poorly in human society and mostly be killed by the camp's dogs before they had a chance to do so. But then the very fact that the Indians already had dogs makes a great change : we're talking about when there were no dogs yet anywhere. Such a well-documented source as Hill (1979) talks about a 2-month-old wolf cub being captured and raised as a dog (see also the consideration hereafter) and uses the Dakotah (or Lakotah) name "true-dog" for the wolf. NB : in her description, this adoption is operated by a person particularly adept at handling animals. Man killing wolves in confusion whilst another predator was the culprit is no fiction. Many livestock guarding dog breeds (not to be confused with herding dogs) are big and white. This may help their adoption into a sheep herd, but it's certainly a bare necessity to distinguish them from wolves and bears in the night and to avoid shooting them by error. Why would the tribe in our scenario have chosen to adopt the wolf cubs? I don't know, but it might have happened under the depicted circumstances and is simply one of the many possibilities under the hypothesis of a process triggered by commensalism and early forms of mutual profit and self-domestication. As I've described it, the wolf cubs would have been roughly two months old at the time of their adoption. Far too late for wolves as we now know them to adapt to humans (if they ever do so in the first place), but did they have the same "inbred" fear of man as their latter-day descendants? Did not this fear spring from the many ages of persecution the species has experienced from us since then? The wolf is unlikely to have been declared such a total enemy before men became livestock breeders and predators changed status from colleagues, competitors and occasional food thieves to despicable rustlers and the very incarnation of evil. Until very recently North American Indians and Eskimos (I'm following Lopez (1987) in using this name rather than Inuit) didn't perceive them as "The beast of waste and desolation" (dixit Theodore Roosevelt). Indeed, their lore comprises a story according to which the wolf was created to cull the sick and otherwise feeble caribou in order to allow man to take the good specimens (Lopez, 1978). Even today attitudes towards wolves are not quite as hostile everywhere in the world and differences exist between neighbouring European countries. What would happen if we spent a few decades selectively breeding wolves as Belyaev has done with the fox, a species that has been just as mercilessly persecuted for numerous centuries and still is in much of Europe? Belyaev chose the fox because he considered that in latter-day wolves mixing with dogs in previous generations could not be excluded and could have influenced his experiments. Using the fox he was sure to exclude this possibility. It would most likely be every bit as excluded if the experiment were to be repeated with wolves from Ellesmere Island, if we could get a sufficient number of them. The role of serotonin in domestication has been suggested by several authors, Grandin et al. (1998) among them. Indeed, this hormone reduces fear and raised serotonin levels were found in Belyaev's tamer foxes. Allman (1999) writes about serotonin in the evolution of the brain. Going into this would lead too far away from the main issue and, moreover, I have only the most basic notions about endocrinology, but Trut (1999) gives some aspects. 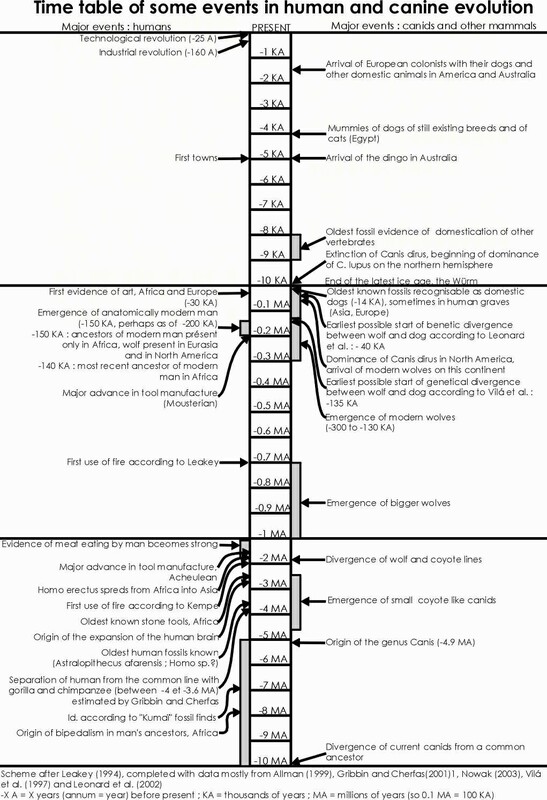 This is merely a summary of information from various sources showing some major events in human and canine evolution, mentioning some on other vertebrates as well. Some of these events coincide temporally. However striking this may appear in certain cases, I don't emit any hypotheses about how this may have come about, apart from the first wolf domestication event of course, which is the subject of this paper. This reference list is not exhaustive and I may well have forgotten some For certain subjects I have chosen to refer to Wikipedia as a shortcut to other references. In other cases (a-DNA on Neandertal for instance) I have referred to more "generic" sources as the subject is not one I have yet had time to go into more deeply. Q. Rev. Biol. 59, 1-32.